I was pleasantly surprised by Glasgow. It seemed to have an interesting vibe to it. Many people see Edinburgh as this fairytale city, which is great. 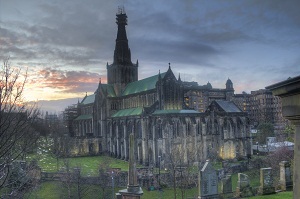 But I thought of Glasgow as a gothic, almost medieval, cit. A city with great power and an intense mood. The stirring of the senses in Glasgow is inevitable. To me, Glasgow felt a little bit like Gotham City from batman mixed with a hint of old New York City. Maybe it was the weather when I was there, but Glasgow almost appeared to be a city straight out of a cartoon or an elaborate movie scene. No place in Glasgow screamed “movie” more than the Necropolis. I headed into the Necropolis about an hour before sunset to try to capture some of the eerie feelings that it seems to exude. It turned out to be one of the most photogenic places I have ever photographed. The green grass couldn’t possibly be greener and their vibrant look couldn’t be contrasted any more greatly than by the soulfully depressing greys of the gavestones and imposing sky. Between short spurts of Scottish rain and heavy winds I managed to pull the shutter of my camera more than I ever intended to. I’ve only seen one of the Harry Potter movies, but the comment among friends who have seen the images already is that the photos remind them of the movies. what a beautiful place, captured perfectly. eerie and solemn. i will, someday, visit places like this too. Thanks Ryo – The Glasgow Necropolis certainly is an emotional looking place! Great shots…I love spending time in old cemeteries. Excellent atmospheric shots. Some of them look like paintings. Love it. Thanks Val – I’m glad you like them. Glasgow Necropolis at times feels like you are walking through a painting. Spectacular place. That sky is perfect for the Gothic look. Gaelyn – Exactly! I was excited when I first saw the sky behind the Necropolis that I was running towards it to get pictures haha. Those are really beautiful! and the weather was sure helping, adding to the beauty! Thanks Mina – You’re right the weather in the Necropolis that day couldn’t have been more perfect for photography. I haven’t seen any of the Harry Potter movies, yet these beautiful photos sure do look like out of a movie. Ayelet – Yeah, from the previews I’ve seen of Harry Potter it almost looks like it was filmed at the Glasgow Necropolis. Wow those pictures look amazing! We missed Glasgow on our last trip to the UK but will surely go back again! Looks very promising indeed! The rather depressing weather really adds to the atomosphere.. Thanks Ashray – After being in Glasgow, I can’t believe how many people skipped it! It’s a really interesting place to just wander around. I have not yet visited Glasgow, I have been to Edinburgh but after seeing this post I shall certainly add Glasgow to the list. What amazing pictures! It’s great to find a travel blog with so much coverage of the UK outside London. I recently walked part of the Northumberland coast and visited the castle where parts of Harry Potter were filmed. It’s such an amazing part of the country! Have you done the coast and castles walk in Northumberland before?